It's official: Charlotte's first football coach is Brad Lambert. With several of his former Wake Forest players on hand, Lambert was introduced as the 49ers' coach at a news conference earlier today. Lambert had some news: He announced that Jeff Mullen, a former offensive coordinator and quarterback coach at West Virginia who was also an assistant with him at Wake Forest, will be Charlotte's first offensive coordinator. Mullen also said he would hire a defensive coordinator soon, and probably a recruiting coordinator. Lambert signed a 6-year deal worth $250,000 per year, with a clause to renegotiate in the spring of 2013 -- just a few months before the 49ers' first game.. Charlotte had originally budgeted $175,000 per year for the job, but increased it during the search process to make it more attractive. Lambert, 46, was an assistant at Wake Forest for 10 seasons, the most recent three as defensive coordinator. Former Deacons standouts including quarterback Riley Skinner, linebackers Aaron Curry, Stanley Arnoux and cornerback Alphonso Smith were at the news conference. Will Witherspoon, a linebacker who played for Lambert when he was an assistant at Georgia, was also there. Lambert and Mullen can't begin recruiting until April 15. Lambert said until then, he'll focus on hiring other coaches and work on logistics -- details such as business cards and recruiting travel plans. Regardless of your opinion on who should be the head coach, if you're a 49er backer, you got a jolt today that football is really coming. We have a coach, an O-coordinator, and they can start recruiting in SIX WEEKS! You would assume that any potential head coach has already checked out the recruiting landscape and will be ready to hit the ground running on April 15. Welcome, Coach Lambert. GO NINERS!!!!!!! Congrats to Brad and Charlotte but selfishly, as a WFU alum, I hate to lose him. Brad has been at Wake for years and by AC, Phonso and Arnoux showing up today, it just shows what he meant to our defense. I really feel like WFU's football fortunes are going to turn around and I'm sorry Brad won't be a part of it. But I'm glad Brad's getting his chance! Good luck, coach. Welcome to Charlotte. We promise to be patient. Coming from the "Please hire Amato" camp, I was planning on at least supporting whoever we hired and giving him the benefit of doubt. However, after watching him speak at the presser, I realize why he was offered the job. He may not have name recognition, fancy green shades and shoes, but it is obvious that he has excitement for this job, character and strong ethics. I have to admit that based on the excitment his speach gave me that I expect he can give a hell of a half time speach. He made me want to enroll in grad school so that I could come back and join him on the field! 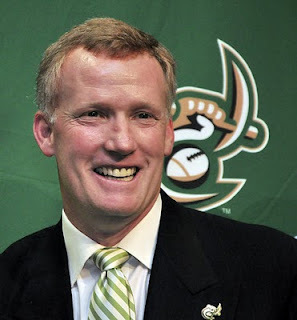 Welcome to Niner Nation Coach Lambert! Anonymous @ 4:32, I hope you didn't learn to spell like that at UNCC. Hiring two BCS assistants to run a subdivision start up program is a great start. This was an excellent hire. I retract everything I thought and said about our new coach. I really like Lambert now and I am excited about Niner football more than ever! Now i feel silly for doggin' out Judy about this hire. Please tell me this story is worthy of more than being in the Gold Mine blog. It is worthy of ESPN. Fire that UNCC hoops coach. This is a football thread moron. Oh thank goodness uncc's new coach is focusing on what's important...BUSINESS CARDS! Yesterday, most called Judy an idiot for hiring Lambert. Today, after the press conference, most are praising the Lambert hire, but not crediting Judy for the choice. I am not defending Judy, just pointing out the reaction of those commenting online. Perhaps, she knows more than most Charlotte Observer readers. If not, maybe some of you should apply for an A.D. job. To win in football takes character and brad lambert obviously is a man full of character. The fact that 4 NFL players who played for brad at wake and ga showed up at his press conference says all you need to know. How could anyone other than a moron dog Judy or the coach before you ever hear him speak. Uncc is fortunate to have him and Judy. Congrats to Judy on an outstanding search. This will do more to connect the university to clt than anything before.